Art time is a favorite at our house so we jumped at the chance to review an art product from See the Light! See the Light is a team of Christian artists who strive to bring a Biblical focus to art and music. Art is taught by master artists using a variety of techniques and media to include pastels, water colors, and crafts. The lessons are complete art instruction on a DVD. The company has programs for cartooning, basic art lessons, portrait drawing, and Biblical storytelling. 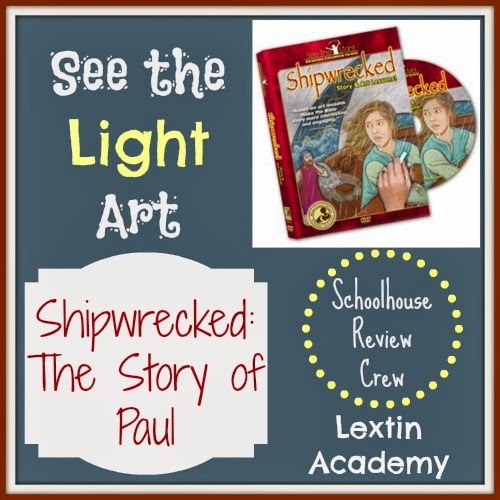 We received the Shipwrecked DVD which tells the story of Paul through chalk pastel drawings. There are 3 art projects taught by different artists on the DVD. The first project is a creative lettering project to spell the word “Courage.” The next project uses chalk pastels to create a picture of Paul’s shipwreck and the last project uses mixed media of watercolor, pen, and colored pencil to make a picture of a lighthouse. The DVD is geared for children over the age of 6, although younger children may enjoy the story portion of the DVD. The DVD retails for $14.99. All of my children from Curly aged 7 to Ladybug aged 2, enjoyed watching the storytelling of Paul’s journey and shipwreck. We watched that DVD countless times during our review period. My older 3 worked on the art projects while I was busy with the little people. They all 3 were able to follow the directions on the DVD to create beautiful completed projects. I found that because my children had exposure to the media used in the art projects, they were all able to successfully and enjoyably work through each lesson together. They’ve already told me that they want to repeat the lessons again! My kids were not overly excited about the blacklight component of the art projects. They were more enthusiastic about simply using the materials and media to create the projects and then display them. The projects are beautiful when completed – even my 4-year-old had wonderful finished products. The explanations are very clear and understandable. My kids were able to follow all the instructions without any help from me. They were all able to complete each project – except Bee lost interest in the mixed media project with all its steps. The Bible story was told with beautiful pastel pictures that held their attention. They were drawn into the story with the illustrations. The projects all center around the Bible story and teach Biblical values and truths. In this lesson, the kids learned about the courage of Paul and how he trusted God even with the shipwreck. I loved how everything tied back to a central theme. This was a wonderful art product! Having a DVD art lesson brought an artist into our homeschool room and my kids were able to be taught by someone with experience in art. They loved following the lessons on the DVD and were very proud of their pictures. They also enjoyed the Bible story! We found this to be an excellent addition to our art cabinet and one that we will use many times over the next years. My kids have already asked for the other DVD’s in the series! Highly recommend!! Read other Crew reviews here! So neat to see you review our very favorite art curriculum! Our kiddos LOVE STL. We own all the biblical DVDs and plan on adding the other ones this year. The blacklight and extreme colors they recommend are so fun. The kids love looking at their artwork with a blacklight after they are done. It adds so much to it! Plus you can also use it for science experiments. We had never used the videos before – I had never heard of them! But my kids LOVED them! I'm going to have to order the rest of the Bible series. And I think Jaylyn will want to do some of their other art videos. They are very well done!